Staging a show or event requires all manner of production. This page lists some of the equipment we have available for hire to stage a production. 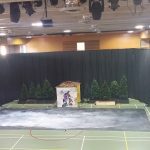 Whether it is a school production or cultural show – we can help your with staging. When we talk about staging in the context of event production hire here we are talking about everything that is required to “Stage” a professional production. Indoor stage or outdoor stage solutions such as stage extensions, podiums, catwalks or risers. Hire Drapes for the back of the stage, drapes for stage backdrops or to improve acoustics as well as give a professional look or provide separation. Hire a Covered Stage for an outdoor event. Lighting Hire for school productions, discos, balls, corporate events and also gigs! 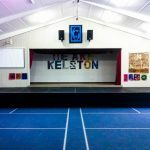 We often build stage extensions for schools who needed more staging for their school cultural event or school production. Extend the stage at the hall or venue. 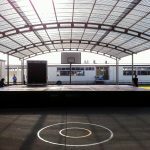 We built this stage for a school cultural event outside on their school netball courts.